Half a hut, equipped with a solar array and an efficient wood-burning stove invented by an emeritus professor of physics at Brandeis, rose on the lawn of Usdan Hall near the ring road this weekend. It is just the tip of the iceberg -- the first public manifestation of an intensive 17-day program planned by students and faculty to raise awareness and share ideas about combating global warming. Organized by the Center for German and European Studies in cooperation with the Campus Sustainability Initiative, the Environmental Studies Program, the Sustainable International Development Program and Students for Environmental Action, the climate-change weeks, presented under the heading "Our Choices Matter," will offer a broad range of discussions, films and demonstrations. Beginning Monday, Nov. 15, emeritus professor of physics Bob Lange will be demonstrating his work with Maasai communities of Tanzania at the structure near Usdan. 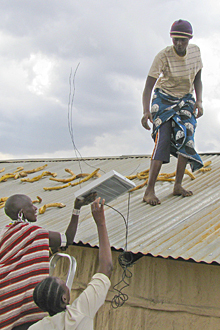 Collaborating with local women to install wood stoves that dramatically improve efficiency and air quality and to install solar cells on people’s rooftops, Lange’s project demonstrates how cutting down carbon emissions and bringing social and health benefits can go hand in hand even in remote communities. Lange will be there Nov. 15, Nov. 18 and Nov. 30 to discuss and demonstrate his work. Undergraduate and graduate students assisted Lange and Eric Olson, senior lecturer in biology at the Heller School for Social Policy and Management, in erecting the structure. a panel of experts debating “How we Can Become Carbon-Free Societies” (4:30 to 6 p.m., Nov. 29, in International Lounge, Usdan), and many others. The programming culminates with a ‘Green Unity Gala’ on the evening of Dec. 1.There is no admission charge, but répondez, s'il vous plait – RSVP – as seating is limited. The evening includes a student debate about nuclear energy, various student presentations, a capella music, good food and a raffle with lots of exciting prizes. As part of Germany’s celebration of 20 years of German reunification, it has launched the Transatlantic Climate Bridge from its embassy in Washington D.C. to support the exchange of knowledge and information about the fight against global warming. Brandeis is one of many US campuses staging climate-change programming this fall with support from this initiative. Brandeis has joined the American University College Presidents Climate Commitment, pledging to become climate neutral by drastically reducing energy use and improving overall sustainability programs. Successes so far include installing one of the largest solar electricity systems in Massachusetts on the Gosman Athletic Center and spending millions to improve energy efficiency on campus. Students have taken up the cause by voting to increase their own activities fees to create the Brandeis Sustainability Fund, which will award $50,000 to campus sustainability improvements for the first time this fall. Students in Laura Goldin’s course “Greening the Ivory Tower” are working on a whole set of projects that can model environmentally friendly changes on campus and in the community. Past project include bike sharing and community gardening. Details of class projects and the winners of Sustainability Fund grants will be announced at the Gala. For more information, contact von Mering at vonmering@brandeis.edu or call Heidi McAllister at the Center for German and European Studies at (781) 736-3227.